Until now, the main route for private merchandise has been Miami-Havana, and from the capital it fans out to the rest of the country. Although it could also make the reverse trip, from an eastern province to the west of the island. Private imports of products from abroad tend to come from Cubans who have the opportunity to travel overseas for their work, such as merchant marines, doctors, nurses, sports coaches, and emigrants, among others. In recent months, the customs authorities have focused their attention on articles imported by emigrants, particularly those based in Ecuador, a nation that has become attractive to Cubans since June 2008, when President Rafael Correa declared that foreigners could enter the country and stay up to 90 days without needing a visa. An opening that Cubans have not squandered. Add to that the advantage that since 2000, Ecuador replaced the former national currency, the sucre, with the U.S. dollar. According to the Ecuadorian Immigration Office, in 2008, 10,940 Cubans entered the country and 9,935 left. In 2009, 27,114 entered and 23, 147 left. And in January and February of 2010, 4,800 arrived and 3,357 departed. Mario Pazmiño, former director of intelligence, estimates that 7,000 Cubans have stayed in the country, many of them with the aim of getting Ecuadorian citizenship. On the other hand, it’s estimated that of the 296,000 Cubans who traveled to the island in 2009, about 200,000 were from the United States and in 2010 that number could approach 300,000. Since the easing of travel restrictions on the part of President Obama, some 20,000 passengers have arrived in Cuba each month. Every one with the accompanying “worms” (huge bags), full of all manner of cheap and knock-off goods. Although official figures are not available, it is assumed that the volume of merchandise imported by way of individuals is enormous. And not just from Ecuador and the United States: thanks to a half-century of socialist poverty, Cubans are among the greatest buyers and sellers of schlock in the world. Starting January 1, 2010, General Customs of the Republic increased the taxes on goods subject to customs fees. It also stressed controls of non-commercial imports coming in with Cuban travelers, with an emphasis on those coming from the U.S. and Ecuador. On the internet we find cases like that of Jorge, age 35, who in Cuba raised pigs for sale. Now, in Quito, he spends every morning shopping, looking for t-shirts, jeans and cheap jewelry, original or replicas. Jorge told the reporter that the greater part of everything “shoddy” he sends to Cuba. If he manages to get through without any problems at Customs, it doesn’t take him long to sell his goods, at lower prices than those in the “shoppings” or hard currency stores. Ecuadorian police sources estimate that 70% of the Cubans who come to Ecuador are what they call “porters,” men or women who contract a marriage to be able to enter and leave the country easily, the better to realize their “commercial activities” between the two countries. 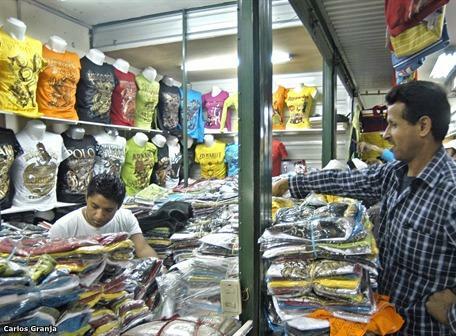 Photo: Cuban in Quito buying shoddy goods to sell in Cuba. Google-Images.